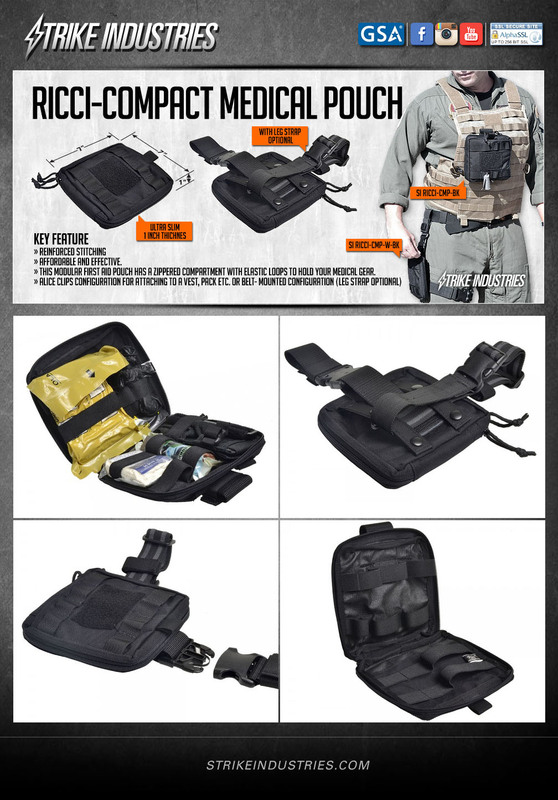 The Strike Industries Ricci Compact Medical Pouch is a modular first aid pouch with a zippered compartment with elastic loops to hold medical gear. Its design allows it to attach to a vest or pack, belt, or leg with the use of an optional strap. The HEX elector switch is a machined, head-treated steel safety selector with textured levers on both sides of the receiver for ease of operation. It features grooved pads for a more secure grip. Available in both single and ambidextrous versions. The Strike Industries J-Comp is based on the compensator used on the Japanese Self-Defense Force’s Type 89 assault rifle. 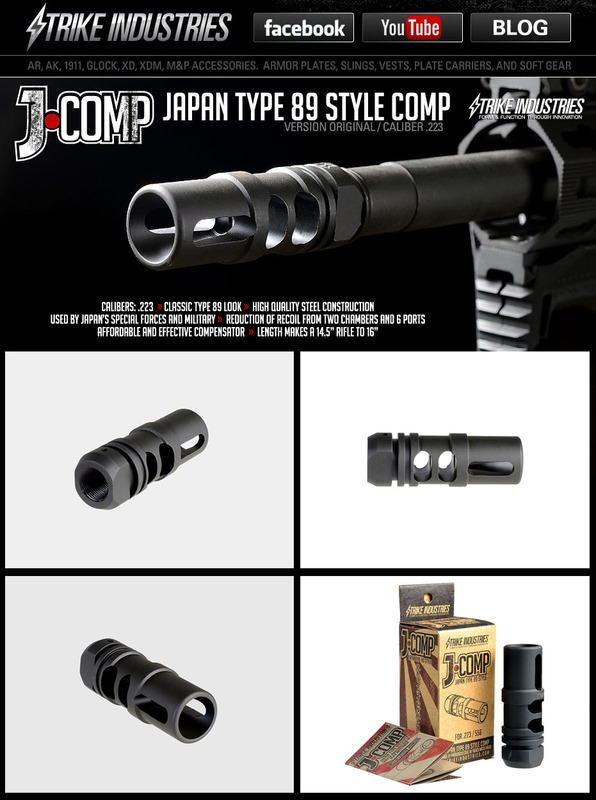 It utilizes a double chamber system and six ported side vents; the front ports act to minimize flash from the muzzle allowing for fast follow up shots. It’s constructed from parkerized steel with a black finish. It’s also long enough to lengthen a 14.5″ to 16″. 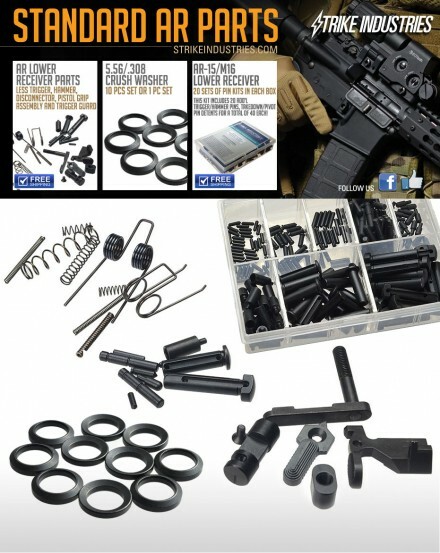 Available for .223/5.56x45mm, although there’s also mention of .308/7.62x51mm and 7.62x39mm models. 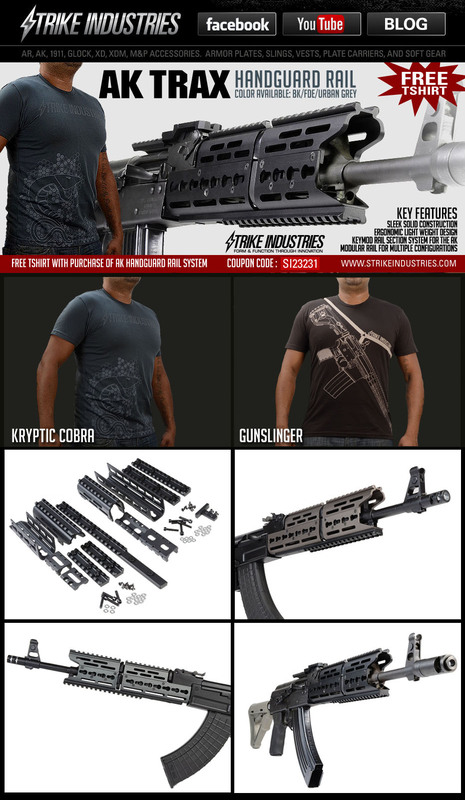 For a limited time, when you purchase an AK TRAX combo from Strike Industries, you can receive a FREE Brown, Grey, or Aqua SI Gunslinger or Kryptic Cobra T-shirt in M, L, XL. Use coupon code SI23231. Strike Industries has just come out with two new t-shirt designs: Kryptic Cobra and Gunslinger. The Kryptic Cobra features the classic S.I. logo and a snake design on the right hand side. The Gunslinger features a design mimicking a slung AR-15. 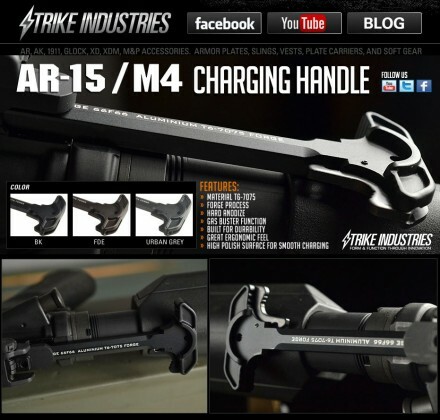 The AR-15 design functions as a sneak-peak of sorts as it features products to be released by S.I. in the near future. Both shirts feature the 2nd Amendment on the back in addition to S.I.’s venom patch logo. They are made from 100% combed ring spun cotton and are available in three colors: Aqua, Brown, and Charcoal. 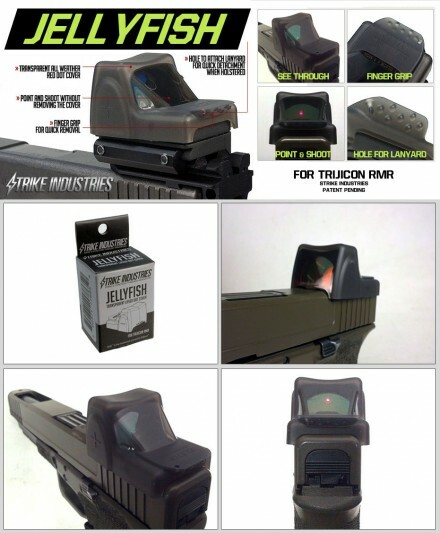 The Strike Industries Jellyfish is a transparent all-weather red dot cover for the Trijicon RMR. This allows for accurate, close-range shooting without having to remove the cover, in case of an emergency. 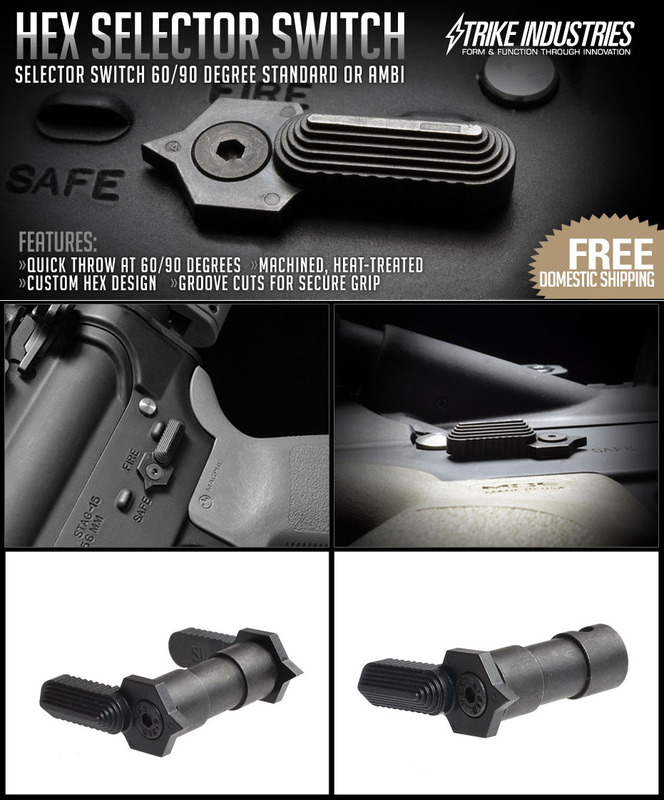 The Jellyfish also features a finger grip for quick removal, and a lanyard hole for quick detachment when holstered. 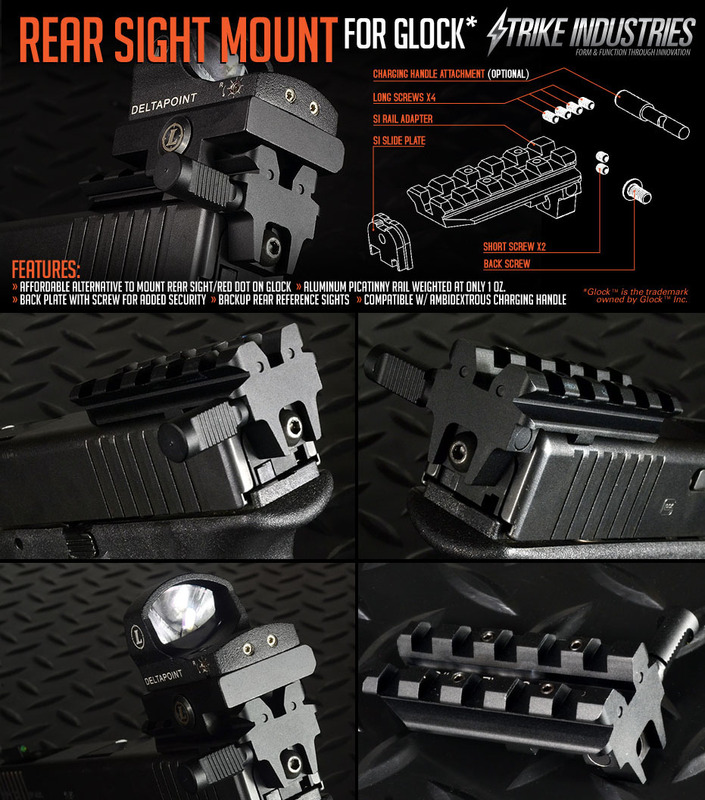 Strike Industries’ Rear Sight Mount is designed to allow for a rear sight/red dot on a Glock pistol without expensive, custom installation. The 1 oz. aluminum picatinny rail is secured with a screw and backplate, and features screws to adjust height. The rail features paintable reference dots if the user chooses not to use an optic. Additionally, a compatible ambidextrous charging handle is available for competitive shooters.